Taxidermy Africa are Master Taxidermists in South Africa. Taxidermy Africa is located in the Eastern Cape town of Humansdorp. Our Taxidermy services include the taxidermy of Trophy Full mounts, Shoulder Mounts and Pedestal Mounts. 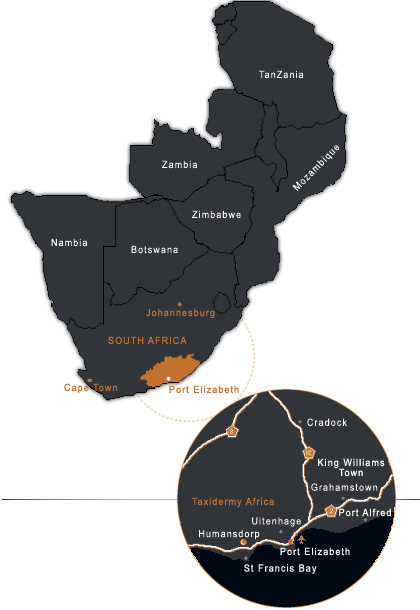 We service South Africa and Africa as a whole and deliver world wide. John and Cathy moved to the Eastern Cape of South Africa in 1989 and started the taxidermy studio with Cathy’s father, Terence Coffin Grey, as their consultant. Our long association with the game industry and personal hunting experience in Zimbabwe, Botswana and South Africa gives us a sound background for reproducing lifelike African trophies to world class standards. Terence Coffin Grey, our consultant, is one of the pioneers and a doyen of the taxidermy industry in Southern Africa. He has more than 70 years of experience in both commercial taxidermy and museum taxidermy. John, a student of Terence from an early age, has practiced taxidermy full time for over 25 years since the inception of Taxidermy Africa. Association of Professional Taxidermists and Game Skin Tanners.